Besides providing clean renewable power at a competitive price from the moment the wind turbine system is brought online, the major financial advantage is the creation of a long term Power Hedge utilizing wind power. In comparison to traditional power generation technologies which generally rely on fossil based fuels such as coal, natural gas, nuclear and others to generate power, these fuels are subject to historically volatile market forces. As the price of these fossil fuels used to generate power using non-renewable fuels swing up and down, sometimes erratically, so does the cost to produce the power based on these fuels, which is "passed through" to the consumer by the power companies, typically by the means of a "fuel charge" or "fuel adjustment cost" added to a typical power bill. As a result of the unpredictable nature of fossil fuel prices, geopolitical and other factors, the combination of these circumstances creates uncertainty as to the cost of energy in the future, even in the short-term. The “fuel” to power a wind turbine system is of course wind, which is a free and readily available inexhaustible source of clean renewable energy.While wind used to drive the turbines is free, it does require an investment in the wind turbine components necessary to harness the power. However by “locking in” the capital costs of a wind installation in today’s dollars, the investment is able to produce power for years to come at essentially today’s capital costs, which in turn yields the long-term benefits of predictable energy costs. The primary commercial or financial benefit of the investment in a wind power generating system is derived from the creation of a long-term hedge against traditionally continuously increasing power costs over an extended period. 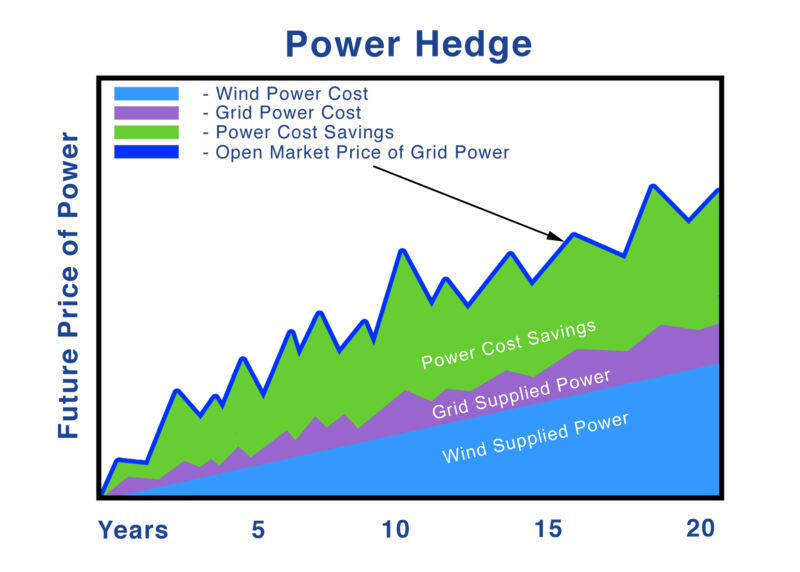 As shown in the Power Hedge graph below, the cost of Wind Supplied Power (light blue shaded area) is based on the determinable set of costs. Those determinable costs to generate the wind power consist of (a) the initial cost to build the wind installation, and: (b) operating cost for the life of the installation. Because the cost of the Wind Supplied Power generation is determinable it provides for a predictable and stable cost of energy over the life of the installation. In contrast to the wind supplied power shown in the Power Hedge graph depicting a "behind-the-meter" scenario (see Power Models, sometimes referred to as "On-site" or "Distributed Energy") is Grid Supplied Power (light purple shaded area). In a "behind-the-meter" scenario, in addition to Wind Supplied Power, power usage is supplemented by traditional Grid Supplied Power for periods of low or no wind. Using a behind-the-meter configuration, a consumer is never without power, however the amount of power the consumer takes from the traditional power grid is less reducing the overall cost exposure to volatile market power price fluctuations. The green shaded area in the graph demonstrates the direct Power Cost Savings over the life of the wind installation. This green cost savings area represents the spread or difference between the market price of power (the dark blue line above the green shaded area) and both the Wind Supplied Power and the supplemental Grid Supplied Power. How Much Power Can Be Produced? The simple answer is: It depends on the commercial wind resources available at a specific location and the installed capacity of the wind power system at that location. Wind power production is expressed in terms of kilowatt hours (kWh) produced annually. The amount of wind power produced annually is a function of the average annual wind speeds at a site, wind turbine capacity and other factors. One of the many advantages of a wind power system is the ability to custom tailor the power generation to the needs of a particular location, including scaling or adapting the size of the installation to the specific power generation requirements of the site. Also for instance, the modularity of turbines allow installations to be scaled up as power needs at a location increase. Additionally, wind turbine installations with more than one wind turbine offer flexibility and the benefit of redundancy. In short, commercial wind turbine installations are site specific, and are designed for and utilized for all sizes and kinds of installations from small, medium and large commercial facilities, all the way up to utility scale.